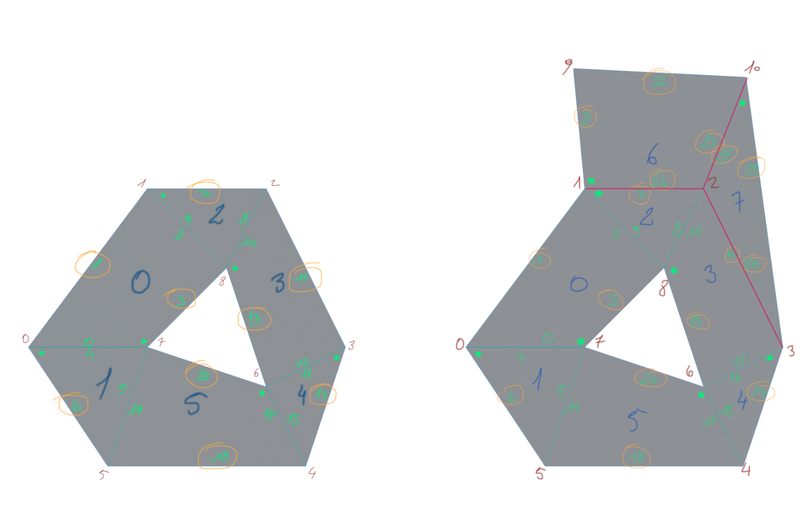 I need to get the outer edges of each Ngon in a PolygonObject. The code in this thread (https://plugincafe.maxon.net/topic/156/13225_get-all-ngons-solved&PID=52316) does not seem to do the trick, as it gives me all outer edges of all Ngons, so I don't know which edge belongs to which Ngon. Why does it give me this error? polymap (list of int) – The polygon map. Pass the list returned by GetPolygonTranslationMap(), or a similarly formatted array. How can I use GetNGonTranslationMap() ? The number of polygons in N-gon i is stored in list _. Then the polygon indices are stored in list _[j] where j goes from 1 to list _. However, this appears to only hold true in the C++ API (where these lists are C-Arrays). In Python these lists hold their size anyways and it doesn't make sense to store them explicitly as the first list item. That also doesn't appear to be what is happening. In the examples I tried it with, if an N-Gon contained three polygons, the list also only had three entries with the polygon indices. Therefore this documentation note seems to be misleading. Hi Frank, thanks for writing us and above all sorry for coming late here. With regard to your question the methods pointed out in the post you're referring to, are actually only paving the first part of the road to get the external (outer) edges of a n-gon. - vertex/point: the start or end point of an edge (marked in red numbers). It's also worthy to note that only n-gon can contain holes and can be concave (tracing a generic segment in the ngon might end in intersecting the ngon external outer/inner edges multple time) whilst a simple polygon cannot have holes and can be only convex (tracing a generic segment in the polygon will never end in intersecting the polygon external outer edges). For the sake of completeness, PolygonObjects which are made of multiple polygons or ngons can instead create holes and be concave as well. compute the area of each island (projected on a 2D-plane) and identify the biggest one which represent the island of the outer edges. The PolygonObject.GetNgonEdgesCompact() is helpful to mark which edges are internal or external in a PolygonObject made by just one n-gon. At the same time Neighbor.GetNeighbor() is helpful to distinguish those external edges which are mutually used by a polygon and a n-gon (or two n-gons or two polygons) from those actually representing the real "external" boundary or a PolygonObject (like those in purple in the image above). So far i don't think that either PolygonObject.GetPolygonTranslationMap() or PolygonObject.GetNGonTranslationMap() are needed, but maybe approaching the problem from a different perspective could be helpful as well. Hope these few lines could help. thank for all the information, you've put a lot of work into this!